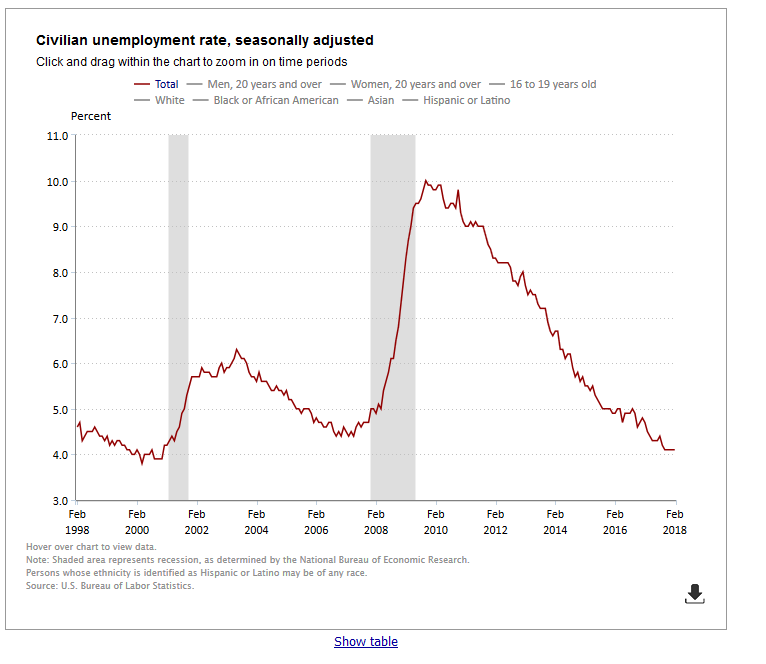 This Employment Blog for March is from the U S Labor Department Bureau of Statistics. 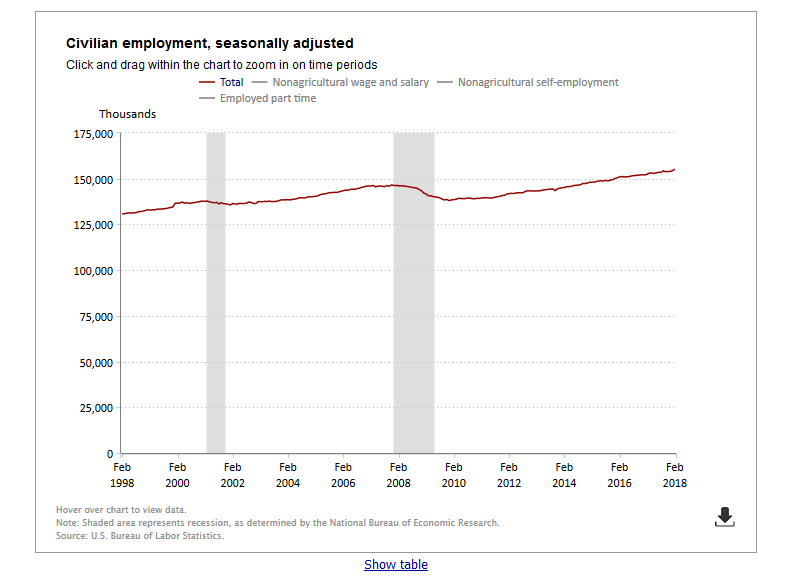 Nonfarm payroll employment increased by 313,000 in February, and the unemployment rate was unchanged at 4.1 percent. Job gains occurred in construction, retail trade, professional and business services, manufacturing, financial activities, and mining. Incorporating revisions for December and January, which increased nonfarm payroll employment by 54,000, monthly job gains have averaged 242,000 over the past 3 months. This information is detailed in Charts 1 and 2 below. Construction employment increased by 61,000 in February and has grown by 185,000 over the past 4 months. Job growth in February occurred among specialty trade contractors (+38,000) and in construction of buildings (+16,000), with these increases split about evenly between the residential and nonresidential components. In February, retail trade employment rose by 50,000. Within the industry, employment increased in general merchandise stores (+18,000) and clothing stores (+15,000). On a not seasonally adjusted basis, these industries hired fewer workers than usual for the holidays and did not shed as many jobs as usual after the holiday season. As a result, employment rose in these industries in February, after seasonal adjustment. However, over the past 4 months, which traditionally see the bulk of the holiday hiring and layoff, employment in these industries has changed little on net. Elsewhere in retail trade, building material and garden supply stores added jobs over the month (+10,000). Employment in professional and business services increased by 50,000 in February and has risen by 495,000 over the year. Within the industry, employment in temporary help services edged up over the month (+27,000). Manufacturing employment grew by 31,000 in February. The industry has added 224,000 jobs over the past 12 months. In February, transportation equipment (+8,000), fabricated metal products (+6,000), machinery (+6,000), and primary metals (+4,000) added jobs. Employment in financial activities rose by 28,000 over the month. Job growth occurred in credit intermediation (+8,000); insurance carriers (+8,000); and in securities, commodity contracts, and investments (+5,000). Over the year, financial activities has added 143,000 jobs. In February, mining employment rose by 9,000, with most of the job gain occurring in support activities for mining (+7,000). Since a recent low point in October 2016, mining has added 69,000 jobs. Employment in health care continued to trend up over the month (+19,000) and has expanded by 290,000 over the year. Within the industry, hospitals added 9,000 jobs in February. Employment in other major industries–including wholesale trade, transportation and warehousing, information, leisure and hospitality, and government–changed little over the month. 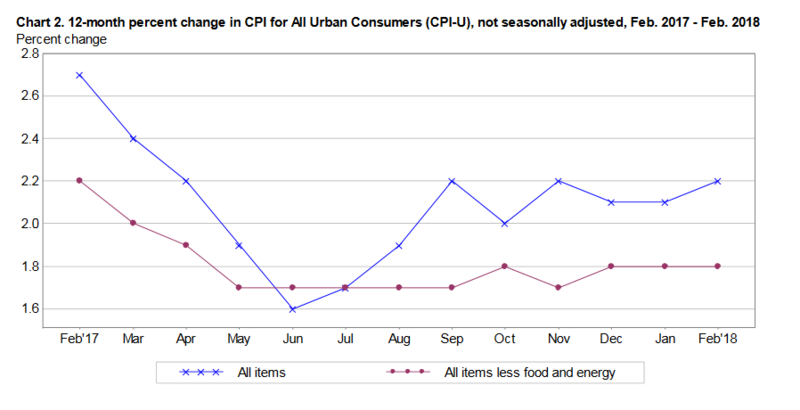 The Consumer Price Index for All Urban Consumers (CPI-U) increased 0.2 percent in February on a seasonally adjusted basis after rising 0.5 percent in January, the U.S. Bureau of Labor Statistics reported today. Over the last 12 months, the all items index rose 2.2 percent before seasonal adjustment. The indexes for shelter, apparel, and motor vehicle insurance all rose and contributed to the 1-month seasonally adjusted increase in the all items index. The food index was unchanged in February, as a decline in the index for food at home offset an increase in the food away from home index. The energy index increased slightly, with its component indexes mixed. The index for all items less food and energy increased 0.2 percent in February following a 0.3-percent increase in January. Along with shelter, apparel, and motor vehicle insurance, the indexes for household furnishings and operations, education, personal care, and airline fares also increased in February. In contrast, the indexes for communication, new vehicles, medical care, and used cars and trucks declined over the month. The all items index rose 2.2 percent for the 12 months ending February, a slightly larger increase than the 2.1 -percent rise for the 12 months ending January. The index for all items less food and energy rose 1.8 percent over the past year, while the energy index increased 7.7percent and the food index advanced 1.4 percent. This information is detailed in Chart 3 below.